We feel so blessed to have become involved with Guide Dogs for the Blind for many years and nine puppies ago. 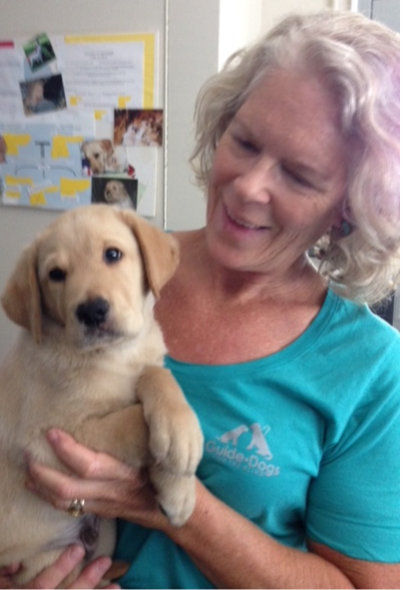 Last week we visited with our seventh puppy, Oxford, and his partner Tom in Danville. They have been enjoying life together for 2 ½ years now. It is such a pleasure to visit them and have Oxford get extremely excited to greet us and seem to remember we are his “parents” while still showing love and connection to Tom. People often ask us if it is hard to give up a puppy that we have raised. Sure it is! We feel a sense of loss and often agree to raise another puppy soon after they go back to campus for their “formal training”. People can often understand our feelings when we say that it is like sending your own children off to college. You hate to see them go, but it would be worse if they didn’t want to go and become the independent, successful beings we want them to be. As Oxford accepts his harness and takes on the role of guide, we head out for a walk and are amazed by his skill and sensitivity in performing his duties. He enjoys his work and loves his partner. Amazing! !